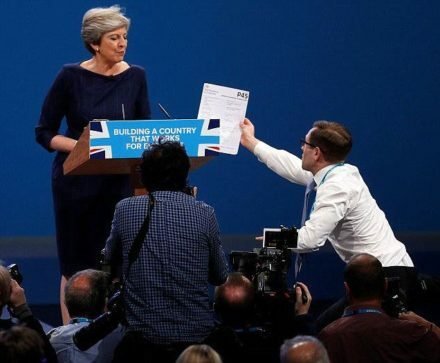 Figures from across the labour movement have given their take on Theresa May’s speech – which was interrupted by a coughing fit and a prankster brandishing a P45 while some of the lettering fell off the stage behind her. “This was supposed to be the speech where Theresa May relaunched her flailing Premiership but it only confirmed her failure. She admitted Britain faces great problems but all she has to offer are watered down versions of Labour’s ideas, reheated policies, and empty promises. “On housing there were warm words but nowhere near enough action, on tuition fees she talked of a ‘review’ but failed to mention that the Tories trebled them to over £9,000 and on energy bills, she provided no clarity after months of confusion and u-turns. And there was nothing at all to deal with the crisis the Tories have created in the NHS, nor to deal with the fact that working people’s wages have flat-lined under the Tories” – shadow cabinet office office minister Jon Trickett. “Theresa May and her party offers nothing but division and deprivation to the people of Scotland and the whole UK. “As this Tory conference proved, they are more interested in fighting among themselves than fixing the very serious issues facing the people of this country. The Tories have run out of ideas and they are running out of time” – Lesley Laird, shadow Scottish secretary. “With the Tories it is more senseless austerity, a stagnant economy where big business profits on the backs of low-paid workers, and a party that squabbles over Brexit while workers’ jobs and rights are placed in peril. “This is now about the best future for the country and the people of our country. Only Labour can act in the national, not narrow party interest. And only Labour can deliver for the many, not the few” – Len McCluskey, general secretary of Unite. Read Len McCluskey’s full response here. “Today’s speech was thin gruel – a missed opportunity to outline the new deal for working people that Britain so desperately needs. The prime minister ignored the plight of Britain’s five million public servants, who deserve a pay rise after seven long years of falling real pay. “She said nothing about cracking down on bad bosses pushing people onto zero-hours contracts, badly-paid agency work and bogus self-employment. And she has no plan to bring the well-paid skilled jobs of the future to every region of the UK. “Instead, we heard more platitudes, designed to quiet her restless party and distract attention from the looming threat of a job-destroying no deal Brexit” – Frances O’Grady, TUC general secretary. “This speech will be remembered for all its mishaps. As symbols go, nothing could illustrate better a government that has no ideas or grip over the Brexit process. “On the biggest issue facing the country the prime minister had nothing new to say.Britain needs more than tired, reheated Brexit lines to get the talks off the ground. “The longer they remain in stalemate, the greater the danger that we leave the EU with no deal” – Pat McFadden, leading supporter of Open Britain. “Theresa May can call herself a ‘proud Unionist’ all she wants, but she leads a party that has pulled apart the bonds that unite us across the UK. “This week’s Tory conference has heard a prime minister without authority, a chancellor without empathy and a foreign secretary without decency. The millionaires will be protected while grinding austerity for the many will continue… And all of this has been met by shameful silence from Ruth Davidson and her Scottish Tories” – Richard Leonard, Scottish Labour leadership candidate. “Her failed austerity programme is dividing our society between the richest and the poorest, and her plan for a hard Brexit is handing the SNP a fresh grievance in its relentless pursuit of independence” – Anas Sarwar, Scottish Labour leadership candidate.